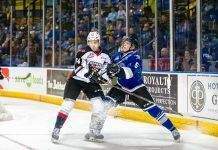 January 16, 2016 Victoria, BC (ISN) – The Victoria Royals went 0-8 on the power play, and dropped a 2-1 overtime decision in game two action on a wrister by Kelowna Rockets Justin Kirkland to split the back to back weekend series. Despite the split, the Royals picked up three of four, all-important, possible points in the two games against the CHL 6th ranked team in the nation. 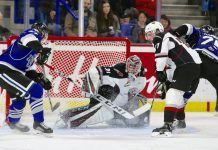 The Royals have defeated the Kelowna Rockets three times this season, and is only one of two teams in the WHL, along with the Everett Silvertips, to hold that distinction. With the race tightening in the Western Conference, every point will prove valuable as both Prince George Cougars and the Everett Silvertips (56 pts. ), just one point behind the Royals (57 pts. 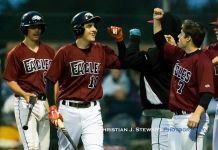 ), look to gain ground on Victoria and Kelowna. The Royals would be outshot 37-31. Both teams were unable to solve the goaltending, going 0-12 on the odd man advantage in the game. It was a game of bounces, with each side getting their chances early. 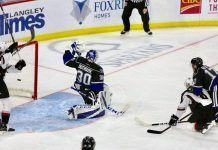 Despite the Rockets owning the play early in the opening period, it was Royal’s Tyler Soy that would put the puck in the back of the net first, beating the game’s first star Rockets goaltender Michael Herringer glove side from close range after Jack Walker tapped the loose puck onto the stick of Soy who would snap it home. For Soy, he has now recorded 16 points in his last 13 games (8g-8a). 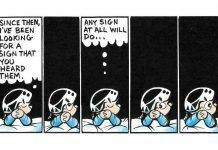 The Rocket’s Dillon Dube would answer three minutes later to even the score 1-1 after dangling the puck at the side of the net and chipping it over the back of a bent over Outhouse to find the goal line. The second period would open up from the tight checking play of the first period with end-to-end action. The Royals winger Regan Nagy would be set free on a breakaway only to be shut down by the Rockets Herringer early in the second period. 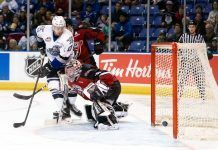 The Kelowna Rockets would afford Victoria a “royal” opportunity to go ahead, committing four penalties in the second period. Unable to take advantage of the opportunity, the Royals and Rockets would go to their respective locker rooms deadlocked one goal apiece. Although outshooting the Rockets 9-4 in a tight checking third period, the Royals would be denied the go ahead marker. 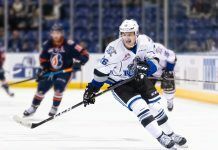 The Royals Logan Fisher would be the closest to put his team ahead when his heavy shot from the wing would find Herringer’s glove, but escape the netminder’s grasp to go just wide of the left post. In OT Justin Kirkland would spoil the Royals two game sweep, to beat Outhouse blocker side for the 2-1 win. For the goaltender’s performance, Herringer and Outhouse would receive first and second stars of the game. Kirkland would take the 3rd star for his game-winning goal. The Royals will meet the eighth place eastern conference Medicine Hat Tigers next Wednesday, on January 20th at SOFMC.